Woo-eee! Fun show last night! Seemed like I played three hundred one-minute songs, but the time just flew by. If you missed the live broadcast you can download the archive (for free, as always) by clicking here. (The archive will also be up on iTunes and my web site shortly.) And, the songs played on the show are listed at the bottom of this post. As much as I love things from the past (old cars, movies, and records), the Internet, obviously, is a great way to connect with rockin' bands from all over the world--and fast. 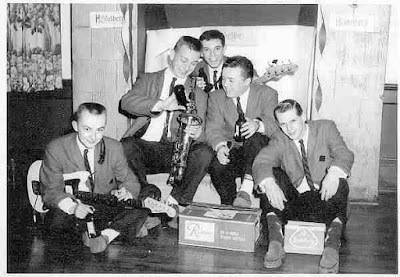 This past Wednesday I wrote to a London band called The Outcasts about a song of theirs--a killer version of "Wild Little Willy." On Thursday they sent me the track (thanks, guys!) and on Friday I played it for all of my listeners to enjoy. Great stuff! Big congratulations to Marti Brom, who this week won an Ameripolitan Music Award (Best Female Rockabilly singer). 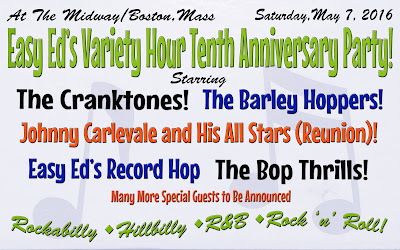 Congrats, too, to Wayne Hancock (Best Male Rockabilly singer); The Bellfuries (Best Rockabilly band) and Charlie Thompson (Best Male Honky Tonk singer). A reminder about the upcoming Jittery Jack U.S. Tour: Boston's Jittery Jack and Miss Amy will soon be traveling all over the country. Check out their Facebook page to see the itinerary and be sure to go see them when they come your way--this is a band you do not want to miss! 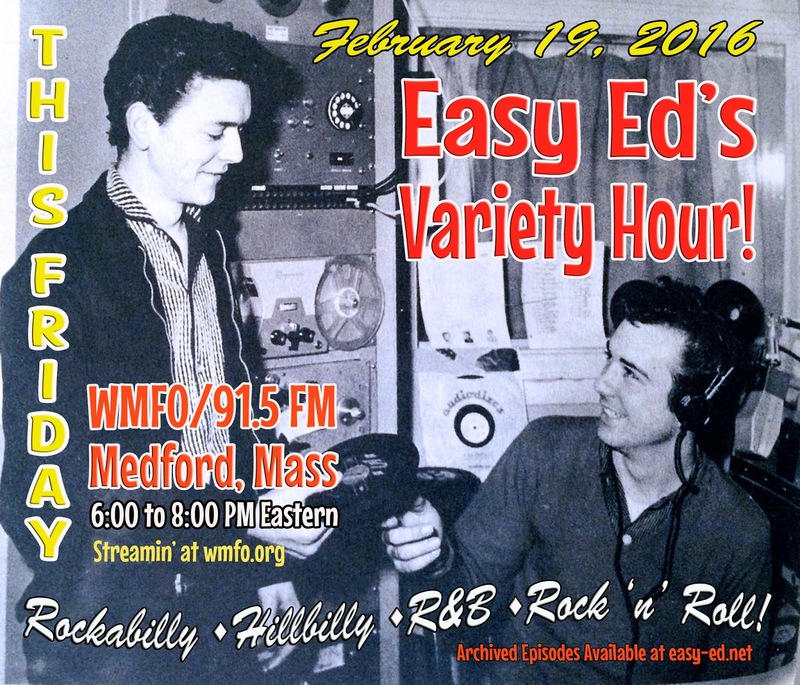 And huge thanks to these guys for inviting me to DJ at their tour kick-off show February 26 at O'Brien's in Allston. Also on that bill are the Alrighters and Cactus Attack. Johnny Carlevale and His Band of All Stars (Special Reunion Show)! Additional Performances by Special Surprise Guests (TBA)! Here are the songs from last night's show. Thanks for listening! Have a great weekend! Jittery Jack “Boston Baby” from Gonna Have a Time with Jittery Jack on Annabelle Records — Check out the tour dates for Jittery Jack and Miss Amy—they’re heading out across the U.S. and will be kicking off the tour with a hometown show on 2/26 at O’Brien’s in Allston! Marti Brom “Great Shakin' Fever” from Wise to You! on Goofin' Records. Congratulations to Marti Brom for her 2016 Ameripolitan Music award (Best Female Rockabilly Singer). Ray Collins Hot Club “Yeah Yeah Baby You’re Right” from Tohuwabohu on Rockin'Rollin' Products — Coming to Montreal (Jive Fest) April 1, 2016. 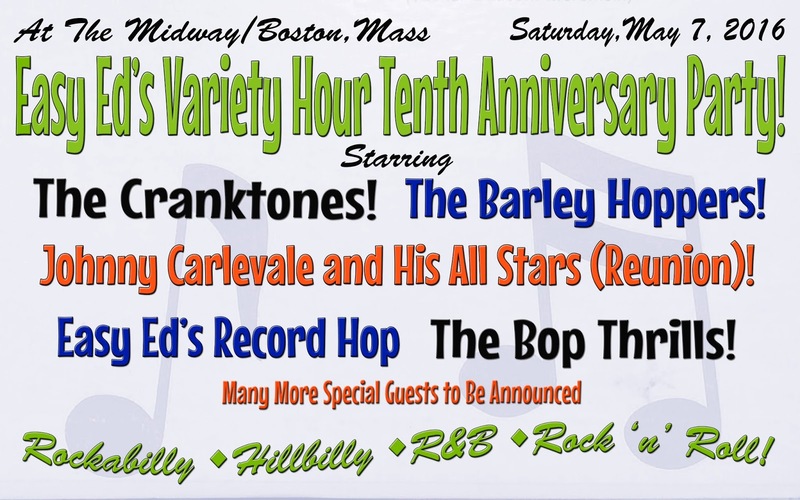 The Cranktones “Mean Little Mama” from Vibrate with The Cranktones on Rhubarb Records — See them at the Easy Ed's Variety Hour Tenth Anniversary Party on May 7 in Boston. The archive of last night's show is available for listening here if you want to check it out. 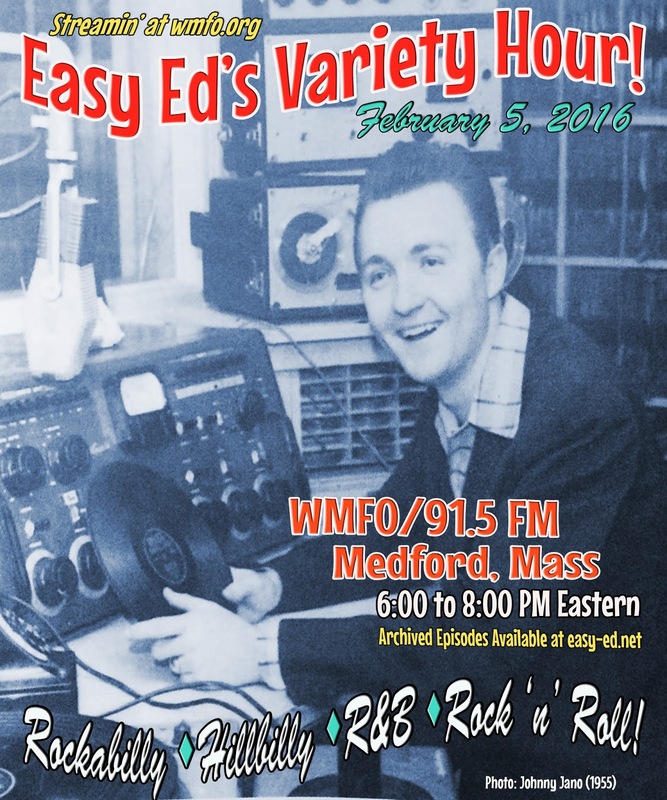 (The archive will be up on iTunes and my web site shortly.) As always, thanks for listening. We wouldn't do it without you. This coming Wednesday, February 10, I'll be spinning records with my good buddy P.J. 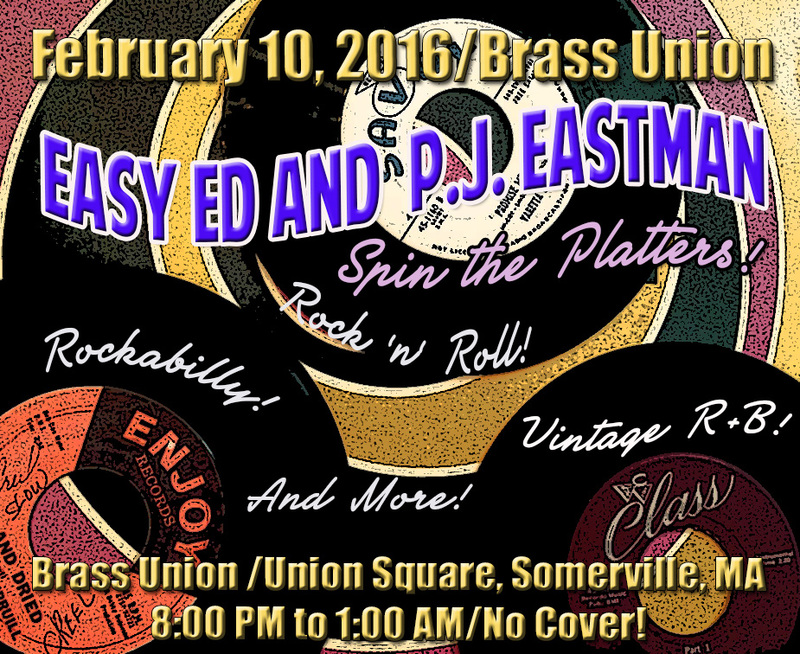 Eastman at Brass Union in Somerville. We do this gig once a month and it's always lots of fun. 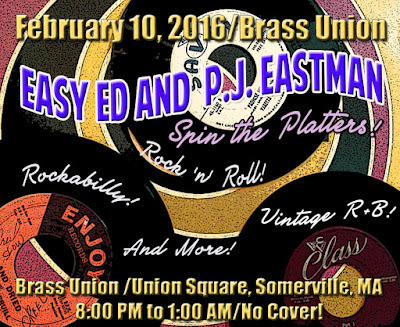 Brass Union has great food and drinks, a friendly atmosphere (not all places have that, as you probably know), and a fantastic sound system for blasting those rockin' 45s. Click here for more details. Here are the songs from last night's show (February 5). Again, thanks for listening! Have a great weekend. Jittery Jack “Little Red Book” from Gonna Have a Time with Jittery Jack on Annabelle Records — Check out the tour dates for Jittery Jack and Miss Amy—they’re heading out across the U.S. and will be kicking off the tour with a hometown show on 2/26 at O’Brien’s in Allston!